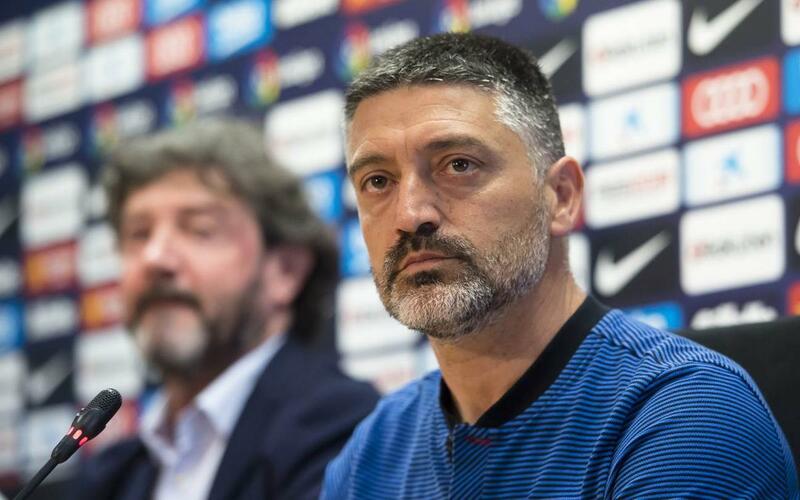 New Barça B coach, Francesc Xavier Garcia Pimienta, spoke in a press conference on Wednesday afternoon, following his first training session in charge. His appointment comes after predecessor Gerard López's contract recision was announced in the morning. Garcia Pimienta comes into the job having recently won the UEFA Youth League, beating Chelsea 0-3 in the final. He previously spent more than two seasons as assistant coach for Barça B. In his press conference, he explained that: "My intention is to train players. I've been here for many years and I believe strongly in the Barça way of playing. The players are ideal for playing here, and no other way of playing makes sense to me with these types of players." "Homegrown players will always be important, and we have very good players at both Barça B and the Under-19s side," he added. Barça B are currently in a relegation battle, third from bottom in LaLiga 123. García Pimienta is optimistic that he can keep the team up. "If we do things well, then we have a big chance of survival. We need to change the dynamic. The team haven't been getting the desired results, but we can push through this pressure. Those who have been at Barça B for a while have to be strong," he told the media. “The club have given me their fullest confidence, and I will be here for the rest of this season and an additional two. I was really keen to coach Barça B one day; it's a big challenge, but I want to keep preparing players so that they become part of the first team." García Pimienta was accompanied by José Mari Bakero and Guillermo Amor at the press conference. Barça B's next game is away against Almeria on Saturday afternoon.